A car is one of the most dangerous weapons many of us will ever possess. Add aggressive driving to that equation, and the results could be fatal. Typical aggressive driving behaviors include tailgating, lane-blocking, abruptly switching lanes, obscene gestures, defying eye contact, excessive horn use, incorrect parking, improper headlight use and even blocking traffic. Also known as “road-rage,” this type of dangerous behavior can encompass any of the above characteristics, but often refers to a more extreme forms of aggressive driving. This is thought to stem from troubles at work or home that later manifest due to frustrating scenarios on the road, such as traffic congestion, motorist misunderstandings, unclear road priorities (ex. right of way) or having other drivers failure to adhere to the rules of the road. Several interesting experiments have been carried out that can help us get some insight and possibly approach these situations differently. If you live in the city, then you are probably familiar with rush-hour and stop/go traffic waves. William Beaty decided that instead of rushing ahead with everyone else to meet the next stop wave, he would drive smoothly and move at the average speed of traffic. By driving at this speed, and not competing with other drivers, Beaty had managed to eliminate the traffic waves, making everyone behind him go at a nice smooth 35 mph or so. Everyone up ahead was still caught in the stop/go cycle. This goes to show how the driving behavior of one motorist had a profound effect on miles upon miles of stop/go traffic. This experiment posed the following scenario: “Say you’re in your car, sitting at a red light behind another car. The lights turn green but the car in front doesn’t move. Twelve seconds go by. Do you think you’d be more likely to honk if the car was an old Ford or if it was a brand new Porsche?” Most people responded that they would be more likely to honk at the luxury car. However, when this experiment was actually carried out by (Deaux, 1971), and Doob and Gross (1968) the results showed that people were actually less reluctant to honk at the high-status car, and were more likely to honk faster and more often at the lower-status car. The reasoning behind this seems to be that people fear or are intimidated (subconsciously, or otherwise) of what high status people can do to them. Thus, aggressive behavior seems to be curbed by status and other aspects of a situation. Do you have tinted windows on your vehicle? If you do, odds are that you are more likely to engage in aggressive driving/road rage behaviors. Patricia Ellison-Potter conducted a series of experiments on road rage and anonymity, and found that there is a correlation between being anonymous and becoming involved in dangerous road behaviors. The role of aggressive slogans in contrast to neutral slogans also played a role in how people reacted while driving. This is a topic of much debate. While many continue to state that music helps people relax and even increase focus in traffic, some studies show that it’s not about listening to music-it’s about the type of music you listen to. According to researchers, music that is noisy and upbeat raises your heart rate. Fast beats can also cause arousal and excitement that can make you focus more on the music than the road. Listening to music that you don’t enjoy can also cause stress and distraction. Aggressive driving is something that can be managed and minimized. It is important to analyze our driving tendencies more carefully and find safer ways to share the roadways- for the safety of all. 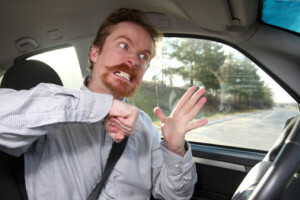 When was the last time you engaged in any aggressive driving behaviors? What can you do to prevent it next time?